I am going to try to put these posts in some kind of chronological order. I don’t seem to be able to re-order them after I post them. Chronological order seems to be a little easier to follow. We were hired by a mining company right out of graduate school to explore for base metals. Three of us came Washington and one from Oregon. I don’t know where the other two came from. We arrived in Ketchikan, Alaska on the first week of June, 1977. Ketchikan is the largest town south of Juneau on the panhandle separating the Pacific from British Columbia. A string of islands protects the coast from the Pacific. Ships of all kinds travel the Inside Passage from Seattle to Juneau and Glacier Bay. This is Southeast Alaska. The islands are covered with Sitka Spruce. These trees are so large that you can’t put your arms half-way around them. The first limbs up their trunks are sometimes twenty feet up in the air. All these forests have grown in the last few thousand years since the end of the last ice age. During the ice age the islands were covered with glaciers that carved out all of the beautiful mountains and fjords that you can see everywhere. Of course now it doesn’t snow so much, it just rains… a lot. Hence the massive conifer forests that stretch out as far as you can see. On a break from outfitting our camps we visited the local visitors’ center where they displayed a long board standing straight up in the air with a horizontal mark on it reading 147 inches at, not surprisingly, 147 inches off the ground. A sign said it represented the twelve feet three inches of rain Ketchikan received on average each year. That’s a lot of rain. Our two man camps were the kind of thing one would imagine sour doughs living in during the Klondike gold rush about 75 years before. Camp consisted ten foot square canvas tents, no tent poles, some plastic tarps, cheep little iron wood stoves, pots and pans, cots, sleeping bags, water-proof rain gear, a canoe, tools, and food. The most fun we had during the outfitting was watching the women watch us getting our stuff at the local supermarket. They knew who we were and what we were about to do and they watched us like we were not all coming back. We would depend on these women to supply us for the next three months. 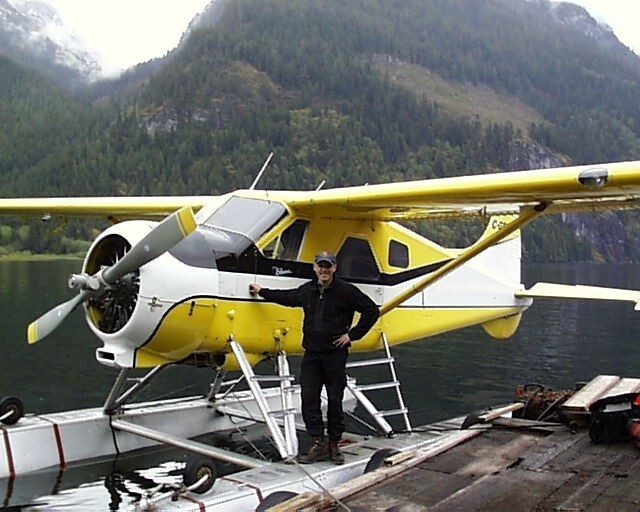 All of our camp and supplies could fit into a de Havilland Beaver, the plane that opened Alaska and Northern Canada.